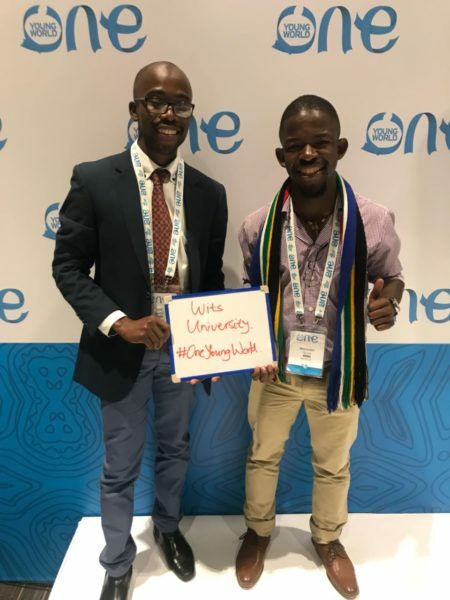 TWO WITS students represented South Africa at the annual One Young World Summit hosted in Bogotá, Colombia last week. The annual summit brings together young talented leaders from 196 countries from global and national companies, NGOs and universities to debate, share and formulate innovative solutions to global issues. Third year mining engineering student, Tefo Mokhine, and fourth year law student, Nkululeko Tselane, were selected based on their leadership qualities, entrepreneurship skills, civic engagement and the work they have done in their communities. Mokhine told Wits Vuvuzela that he was the only one who represented a student business club from South Africa called the Young African Global Entrepreneurs Club (YAGEC). The business club was created last year by a Wits student, Diketso Phokungwane. “Representing YAGEC was an honour for me, our aim is to expand our network of entrepreneurs from across Africa and the world,” Mokhine said. Mokhine was a delegate speaker and shared the stage with former Public Protector Advocate Thuli Mandonsela and the CEO of Emergent Telecom Ventures, Mahommed Amersi. “It was a really humbling and great learning curve, having to address 1 300 people is not a small feat at all. I learned a lot about the experience and happenings of many other countries. I feel empowered and more learned now,” said Mokhine. Phokungwane said that Mokhine representing the club internationally is a first major step. “Having that world stage and being the only business club to do so from South Africa presents a huge stepping stone form us,” Phokungwane said. RELATED ARTICLES: One Young leader at a time, September, 2016.